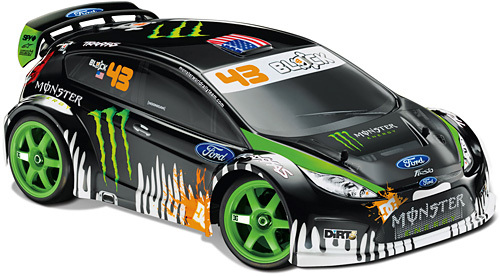 Have 1/16 As Much Fun As Ken Block Does With This RC Version Of His #43 Ford Fiesta | OhGizmo! By Andrew Liszewski on 12/27/10 • Leave a comment! Ken Block’s Gymkhana videos have racked up millions and millions of views, and quite frankly they look like just about as much fun as anyone can have with a car. And while you can head out to your local Ford dealer and pick up a Fiesta for yourself, it unfortunately won’t come with the hundreds of thousands of dollars worth of improvements needed to pull off those Gymkhana tricks. So what’s the next best thing? Why a 1/16-scale version of course! Out of the box this miniature version of Ken Block’s ride features all the livery and graphics of the full-scale version, and is capable of hitting 30mph+ with the included battery. And if you get the optional upgrade which includes a second battery, pinion gear and speed connector, you can push that to 50mph+. It’s 4WD too allowing you to pull off a lot of the same stunts that Ken does (including shallow depth-of-field promo videos as seen below) but since you’re driving a safe distance away via a wireless controller, you never have to worry about protective gear or even wearing a helmet. And while it won’t cost you hundreds of thousands of dollars, or a new set of tires after every run, you can still expect to pay about $300+ for this mini Fiesta, not including the controller.